Grenadine lanterns, Arabic lamps and wrought iron lamps. 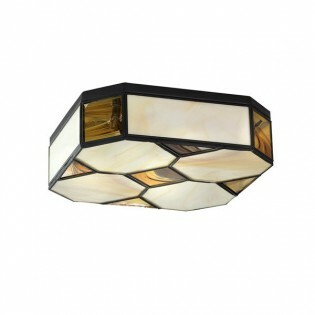 Handmade opal glass ceiling light. 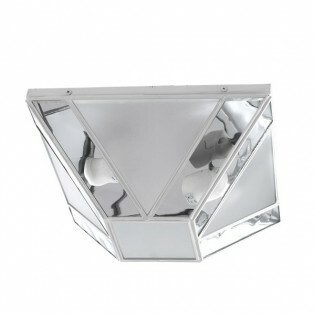 Pyramidal shape, silver finish with pieces of opal glass in different finishes (glossy, matt, transparent). Nice effect due to the gloss of the different finishes. Perfect for hallways, entrances, living rooms, dining rooms and bedrooms Available in three sizes:- Small: 10 x 25 cm.- Medium: 13 x 30 cm.- Big: 17 x 40 cm. 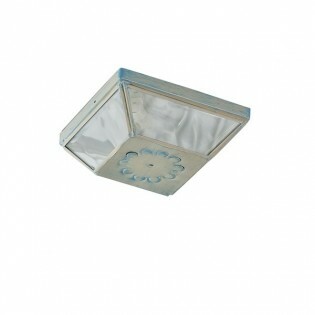 Handmade opal glass ceiling light. 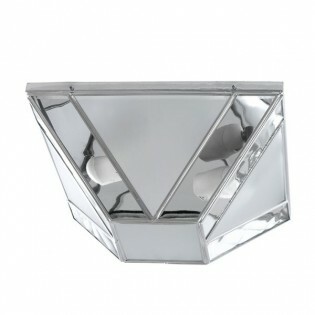 Pyramid-shaped white finish with pieces of opal glass of different finishes (glossy, matt, transparent). Nice effect due to the gloss of the different finishes. Perfect for hallways, entrances, living rooms, dining rooms and bedrooms Available in three sizes:- Small: 10 x 25 cm.- Medium: 13 x 30 cm.- Big: 17 x 40 cm. Pendant Light Alcazaba III. Made in forge black color and crystal Transparent in round form. Perfect for terraces, patios or halls as well as corridors or lounges. Available in three sizes:- Small: 40 x 17 cm.- Medium: 45 x 20 cm.- Big: 50 x 22 cm. Forging lamp Damo. Also known Arabic style lamp for hanging on the ceiling. Rectangular shapes with Transparent glass. 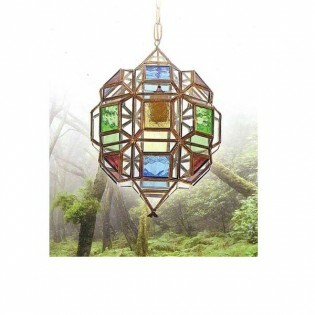 A perfect decorative lantern to place in halls, halls or rooms of rustic or classic style. Available in two sizes:- Small: 40 x 20 cm.- Medium: 60 x 23 cm. 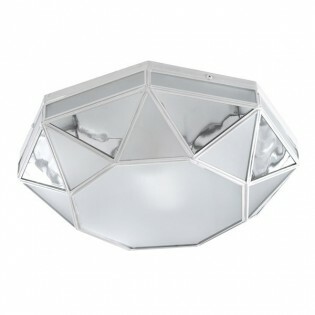 Pendant Light for the ceiling Flor. Made in forge and transparent glass in the shape of a rectangular cone. The forge reminds us of certain plant motifs, hence its name. Perfect for terraces, patios or halls as well as corridors or lounges. Dimensions: 33 x 22 cm. 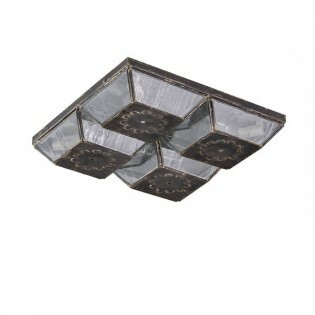 Granada flush light in arab style handmade in metal with 4 faces with geometric shapes and floral decoration. Finished in achab with moon glass. Suits very well with rustic style stays or Mediterranean style cellars. Available in 4 sizes:- Small: 14 x 14 cm.- Medium: 17 x 17 cm.- Big: 22 x 22 cm.- XL: 27 x 27 cm. Granada Flush light in arab style, handcrafted. 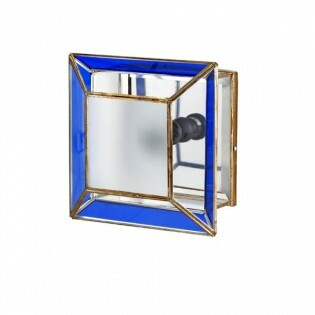 Metal structure with double lampshade effect in a geometric shape with a golden patina finish and pieces of transparent and coloured glass, mirror reflector. Perfect for hallways, entrances, living rooms or bedrooms, also for hotels and restaurants. Dimensions: - Small: 20 x 35 cm.- Big: 25 x 50 cm. Granada Flush light in arab style, handcrafted. 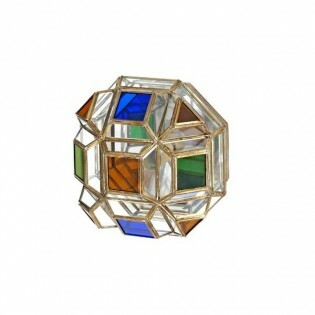 Metal structure in a circle with geometric shapes, gold-coloured patinated finish with coloured glass parts, fine finish, mirror reflector. Perfect for hallways, entrances, living rooms or bedrooms, also for hotels and restaurants. Dimensions: 20 x 33 cm. Granada Flush light in arab style, handcrafted. 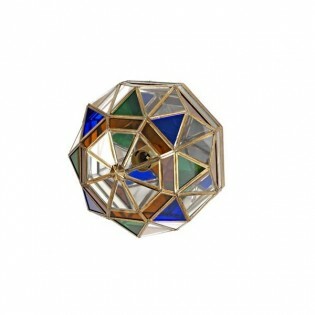 Metal structure in a circle with geometric shapes, gold-coloured patinated finish with coloured glass parts, opal finish, mirror reflector. Perfect for hallways, entrances, living rooms or bedrooms, also for hotels and restaurants. Dimensions: 20 x 33 cm. Granada Flush light in arab style, handcrafted. 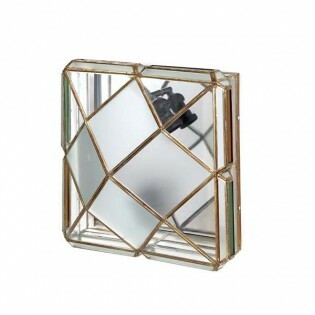 Squared metal frame with geometric shapes, gold-coloured patinated finish with transparent and opal glass parts with mirror reflector. Perfect for hallways, entrances, living rooms or bedrooms, also for hotels and restaurants. Available in two sizes:- Small: 17 x 36 cm.- Big: 25 x 48 cm. Granada Flush light in arab style, handcrafted. 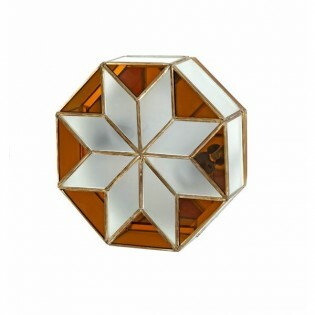 Semi-hermetic metal structure with geometric shapes, gold-coloured patinated finish with coloured glass parts, opal finish, mirror reflector. Perfect for hallways, entrances, living rooms or bedrooms, also for hotels and restaurants. Dimensions: - Small: 17 x 25 cm.- Big: 19 x 30 cm. Granada Flush light in arab style, handcrafted. 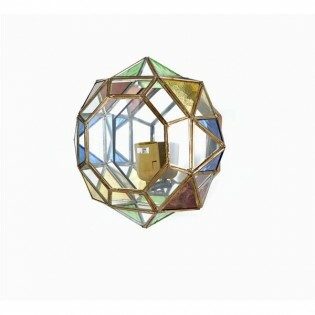 Semi-spherical metal structure with geometric shapes, gold-coloured patinated finish with coloured coloured glass parts, mirror reflector. Perfect for hallways, entrances, living rooms or bedrooms, also for hotels and restaurants. Dimensions:- Small: 17 x 25 cm.- Big: 19 x 30 cm. Granada Flush light in arab style, handcrafted. 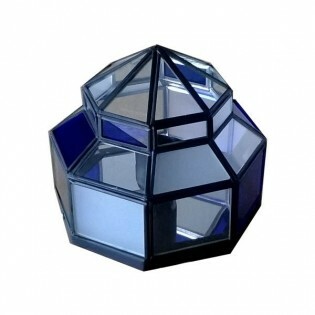 Semi-hermetic metal structure with geometric shapes, dark colour finish with coloured glass parts, opal finish, mirror reflector and blue. Perfect for hallways, entrances, living rooms or bedrooms, also for hotels and restaurants. Dimensions: 15 x 20 cm. Granada Flush light in arab style, handcrafted. 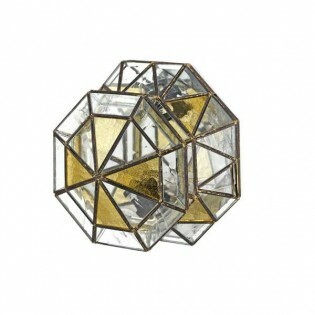 Semi-spherical metal structure and geometric shapes with gold patinated finish and ransparent glass parts with mirror reflector. Perfect for hallways, entrances, living rooms or bedrooms, also for hotels and restaurants. Available in three sizes:- Small: 15 x 25 cm.- Medium: 17 x 30 cm. - Big: 25 x 40 cm. Granada Flush light in arab style, handcrafted. 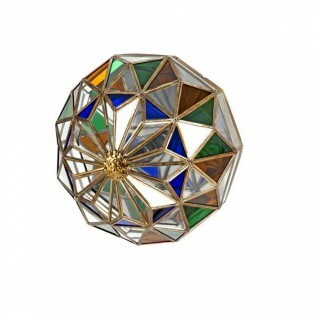 Semi-spherical metal structure with geometric shapes, gold-coloured patinated finish with coloured glass pieces with mirror reflector. Perfect for corridors, halls, living rooms or bedrooms, also in hotels and restaurants. Available in two sizes:- Small: 10 x 22 cm.- Big: 18 x 40 cm. 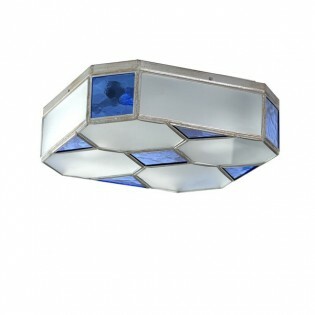 Granada ceiling flush light in arab style handmade with a tulip made of opaline glass and stained-glass blue pieces with metal edges finished in aged silver. Perfect for rooms, yards or covered porches, as well as hallways, lounges or cellars in Mediterranean style. Available in 2 sizes:- Small: 8.50 x 25 cm.- Big: 8.50 x 30 cm. 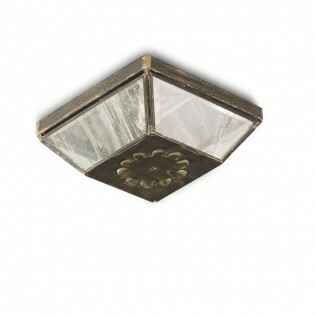 Granada ceiling flush light in arab style fhandmade with a tulip made of pieces of Opal cream glass and Verona Honey with edges of aged metal finish. 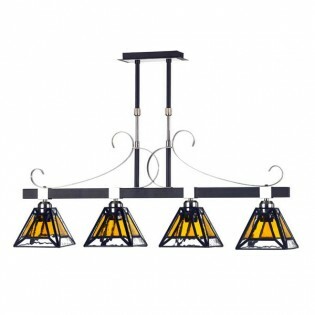 Perfect for rooms, yards or covered porches, as well as in hallways, lounges or cellars in Mediterranean style. Available in 2 sizes:- Small: 8.50 x 25 cm.- Big: 8.50 x 30 cm. Granada ceiling flush light in arab style handmade with a four-piece metal front and floral decoration, Achab finish with Gothic effect glass. 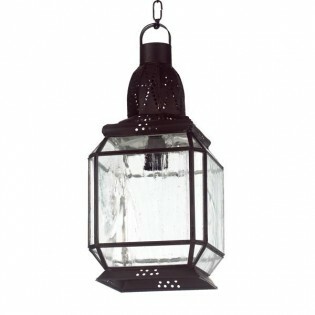 Perfect for rooms, yards or covered porches, as well as hallways, lounges or cellars in Mediterranean style. Available in 2 sizes:- Small: 6 x 25 cm.- Big: 6 x 30 cm. 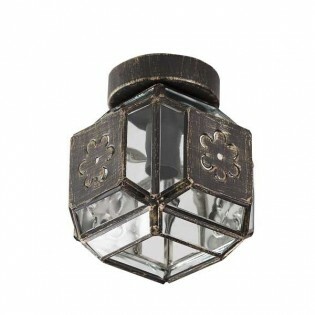 Granada ceiling flush light in arab style handmade with a four-body metal front and floral decoration, silver aged finish with Luna effect glass. Perfect for rooms, yards or covered porches, as well as hallways, lounges or cellars in Mediterranean style. Available in 2 sizes:- Small: 6 x 25 cm.- Big: 6 x 30 cm. Granada ceiling flush light in arab style handmade with metal front and floral decoration, cream blue finish with gothic glass effect. 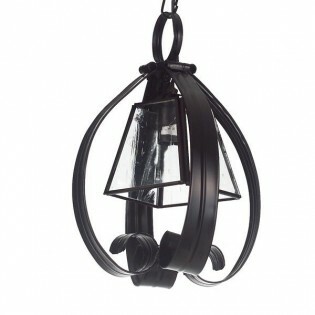 Perfect for rooms, courtyards or covered porches, as well as in hallways, lounges or cellars in Mediterranean style. Dimensions 6 x 15 cm. Granada ceiling flush light in arab style handmade with metal front and floral decoration, Achab finish with Moon effect glass. Perfect for rooms, yards or covered porches, as well as in hallways, lounges or cellars of Mediterranean style... Dimensions 6 x 15 cm. Granada Flush light in arab style, handcrafted. 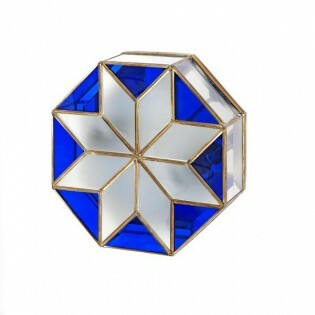 Squared metal structure with geometric shapes, gold patinated finish with opal and blue glass pieces, fine finish, mirror reflector. 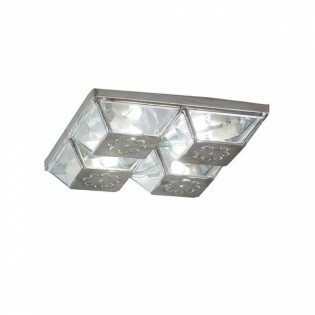 Perfect for hallways, entrances, living rooms or bedrooms, also for hotels and restaurants. Dimensions: 13 x 25 cm. 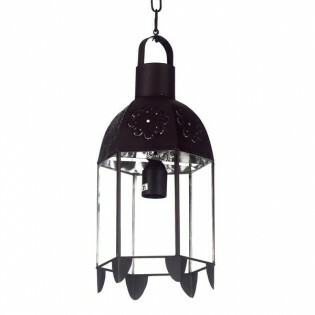 Granada lantern pendant. Also known as lantern or Arabic style lamp . 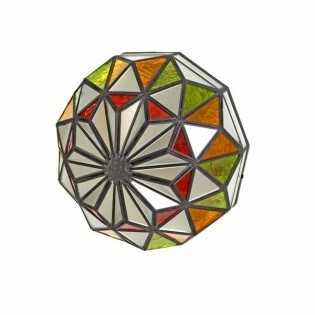 Ornaments in geometric form and ransparent glass. Finished in black colour. 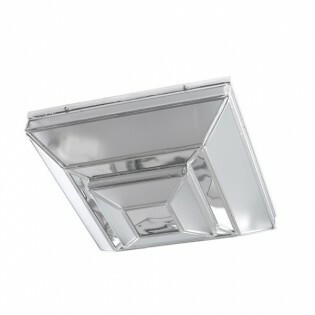 Perfect for terraces, patios or halls as well as corridors, halls or wine cellars. Available in three sizes: - Small: 22 x 18 cm. - Medium: 30 x 23 cm. - Big: 35 x 30 cm. 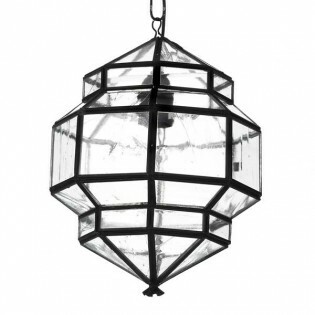 Granada lantern pendant. 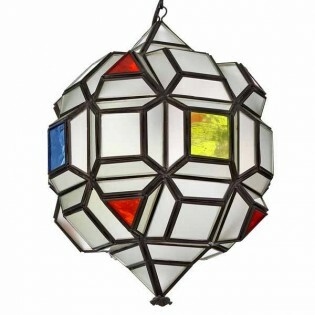 Also known as lantern or arab style lamp. Metal edges making geometric shapes and glass with a semi-transparent stained glass effect. Antique gold finish. Perfect for terraces, patios or halls as well as hallways, lounges or cellars. Available in three sizes:- Small: 22 x 18 cm.- Medium: 30 x 23 cm.- Big: 35 x 30 cm. 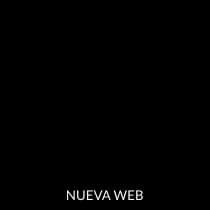 Granada lantern Al Andalus. Also known as Arabic style lamp. 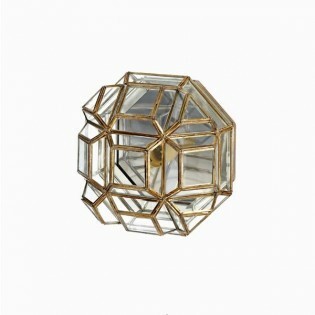 Lamp of great size with geometric shapes and gold color. 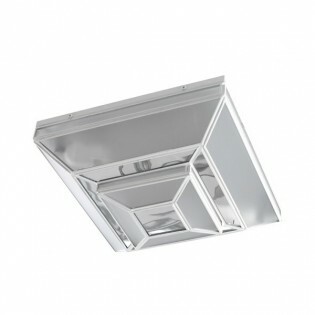 Perfect for bigs stays, hotels, halls or restaurants with Heights ceilings. Available in four sizes: - Small: 80 x 50 cm. - Medium: 120 x 70 cm. - Big: 150 x 90 cm. - XL: 200 x 110 cm. - XL: 200 x 110 cm. 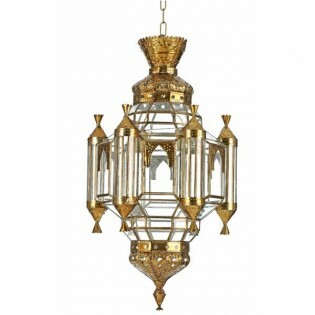 Granada lantern Pendant Light Al Andalus II. Also known as Arabic style lamp. 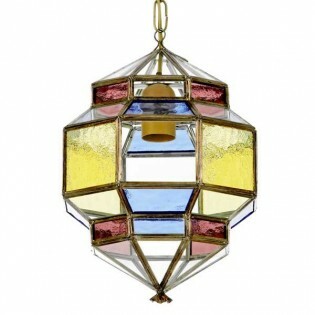 Lantern with geometric shapes and Transparent glass combined with glass painted in different colors... Perfect for corridors and lounges as well as charming hotels and cottages that want to give a special touch to their Lighting. Dimensions: 38 x 30 cm. 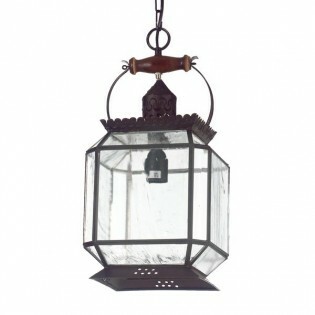 Granada lantern Pendant Light Al Andalus II Opal. Also known as Arabic style lamp. 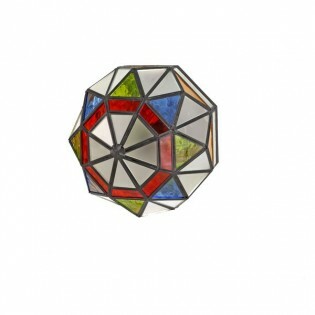 Lantern with geometric shapes and opal glass combined with glass painted in different colours. Perfect for corridors and lounges as well as charming hotels and cottages that want to give a special touch to their Lighting. Dimensions: 38 x 30 cm.